4-Color Process (4CP): Price includes a 4-color process imprint on a white surface. FREE stock backgrounds available. Clip imprint not available. See diagrams for image size, imprint area and location. Choose 1 trim color. Flow lines may be visible in metallic trim colors. 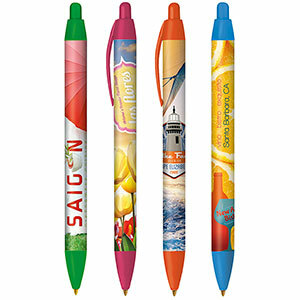 All include a full-color wrapped barrel. Easy Glide New FREE Option!